The Gender Equality in the Workplace Survey is Live! The Nevada Secretary of State's "Gender Equality in the Workplace Survey" is now live. 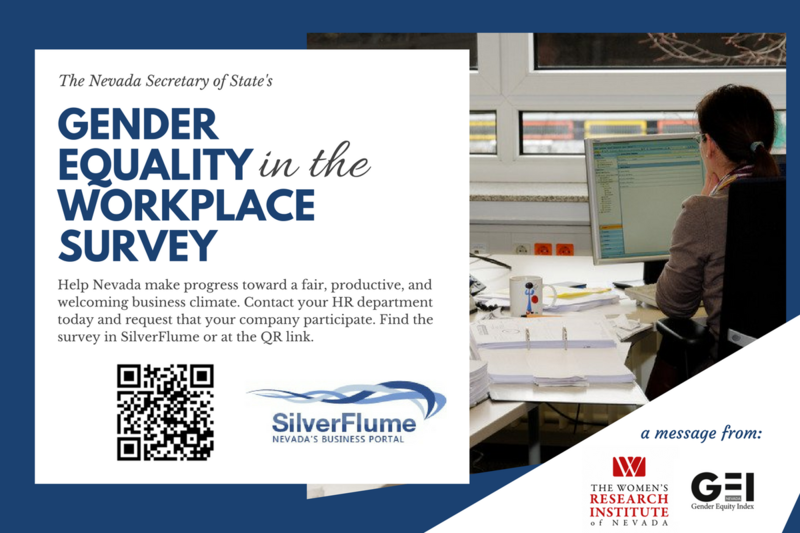 This survey is the result of AB 423, which directed the Secretary of State to collect information about equity practices in Nevada workplaces. The Women's Research Institute of Nevada (WRIN) assisted the Secretary of State and the Nevada Commission for Women to design this short survey. The questions focus on the policies and practices that are empirically proven to promote shareholder profits, increased productivity, and higher workplace satisfaction for all workers---including women. Businesses will now be prompted to complete this survey when they renew their business licenses through SilverFlume, Nevada's business portal. Nonprofit organizations and government entities can participate by visiting the survey page directly. The Secretary of State's office will collect these data and use the responses to generate a report to the Governor and the Director of the Legislative Council Bureau. In addition to this summary report, WRIN will be using these data as a key data source for our Gender Equity Index (GEI) project. profitability. The project will produce a number of reports to provide evidence-based, actionable information for business leaders, policymakers, and the public. The GEI Project also seeks to recognize those companies with exceptional practices, drawing lessons from them to help other businesses reap the benefits of improved workplace equity. Please help us to get the word out! Contact your HR department today and request that your company participate. Information about how AB423 and other 2017 impacts on the work of the Secretary of State can be found here: http://nvsos.gov/sos/home/showdocument?id=2887.